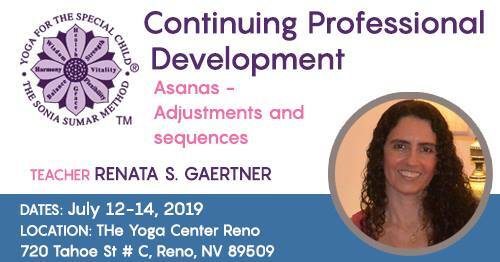 Each year in June The Yoga Center Reno hosts Yoga for the Special Child® Teacher Trainings, including Certification Programs and Continuing Education Programs. The Basic 1 and Basic 2 Certification Programs are accredited by the Yoga Alliance for the 95 Hour Registered Children’s Yoga Teacher designation, and the Continuing Education Programs are also accredited by Yoga Alliance. All Yoga for the Special Child® Trainings qualify for Nevada CEU’s for PT, OT, SLP, ECE and Nursing. The Yoga for the Special Child® 200 Hour Teacher Training is held in rotating locations each year. Click here for Yoga for the Special Child Program dates and locations around the world. Scroll down for more information about these programs. Yoga for the Special Child® Basic 1 Program is a comprehensive training course in the theory and practice of teaching yoga to babies and children ages 0 – 12, including those with learning or developmental disabilities. Designed for parents, yoga teachers, educators, physical and occupational therapists, and health care professionals, this program provides the basic tools for teaching yoga to children with special needs. No previous experience in yoga is required to attend this teacher training program. Benefits to children participating in Yoga for the Special Child® – the Sonia Sumar Method are mindfulness, concentration, physical ease, emotional balance, and ultimately peace of mind and happiness. Kathy Randolph’s week-long training addresses the following topics: choosing the most effective yoga routine, creating the optimum home and classroom environment, specialized breathing exercises and relaxation techniques to improve concentration, and adapting yoga techniques to children with different syndromes and disorders. Populations addressed include individuals living with: autism, Down Syndrome, cerebral palsy, attention deficit/hyperactivity disorder, and other cognitive and learning disabilities. No previous experience in yoga is required to attend this training program. $1,080.00, $300 deposit to reserve your place, balance due by May 15, 2019. $980.00, Early Bird Discount, pay in full by March 10, 2019. $944.00, Licensed Practitioner Retake discount. Yoga for the Special Child® Continuing Education on Scleroderma and Arthritis is a comprehensive training course in teaching students of any age with Scleroderma or Arthritis. 200HR Yoga Teacher Training and 1 year teaching a population with special needs. Health background (PT, OT, RT, SLP, Nurse, Special Education Teacher) plus 1 year of consistent personal yoga practice. Yoga the Special Child Basic 1 Program plus 1 year of consistent yoga practice. The symptoms of Arthritis, how relief is provided by yoga practice, safety issues, video and demonstration by Kathy Randolph with participants. $530.00, $180 deposit to reserve your place, balance due by May 21, 2019. $480.00, Early Bird Discount, pay in full by March 10, 2019. 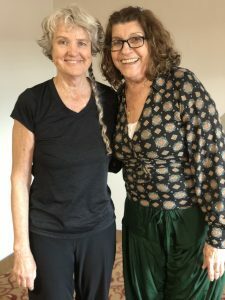 A brand new Continuing Education program developed by Renata Sumar Gaertner to help you improve your understanding on how to safely adjust yourself and your student(s) in a yoga pose and how to build sequences to help you to connect deeper within. Morning Meditation and Hatha Yoga Class. How to add variations to Surya Namaskar without losing its focus and flow. Anatomy of asanas – how to apply the knowledge when teaching yoga poses. Adjusting yourself in a yoga pose and cultivating inner awareness. Adjusting your students in a class. How to teach them the knowledge of learning from within. The practice of Pranayama to increase focus during your practice of asanas. Creating sequences for yoga class that will accommodate different levels of students. This course is open to therapists, Yoga instructors and Yoga students with a year or more of Yoga practice/experience. $550 if you request a PayPal invoice. For more information see our Registration Letter.